f you’re not a fan of plain water, spiking your water with fresh fruit, veggies and herbs just got a lot easier. Aqua Zinger and Citrus Zinger to the rescue. Established in 1985 as Delicious magazine, Delicious Living is the leading consumer magazine in the natural products industry. 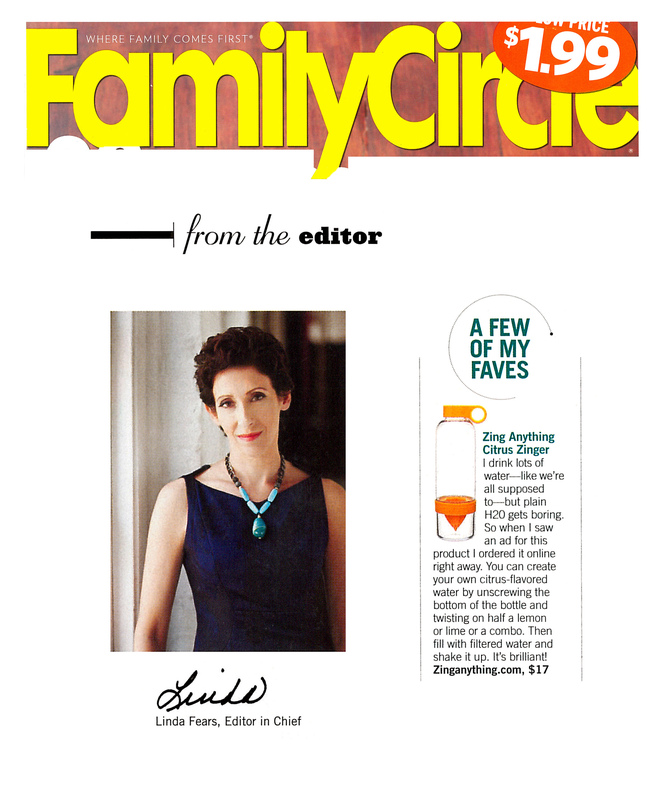 It is carried by more than 1,300 top natural products stores and is read by more than one million readers each month. I drink water constantly when I'm training, but this bottle makes it fun. The bottom-mounted grinder allows you to infuse your water with fruit and herbs. Zing anything with the unique Aqua Zinger! This handy product allows you to add fresh ingredients such as lemon, strawberry, or herbs and spices to make your fresh water taste even better. And there's no carbontation or added sugar. The Citrus Zinger is a unique water bottle that allows you to press lemons, limes, and clementines directly into your water, creating deliciously flavored drinks that are all natural and free of refined sugars and artificial ingredients. These glass and metal bottles from Zing Anything let you infuse water with real whole foods, not "flavorings". Enjoy your water with the fresh taste of lemons, cucumbers, or mint. I drink lots of water-like we're all supposed to-but plain H2O gets boring. So when I saw an ad for this product I ordered it online right away. 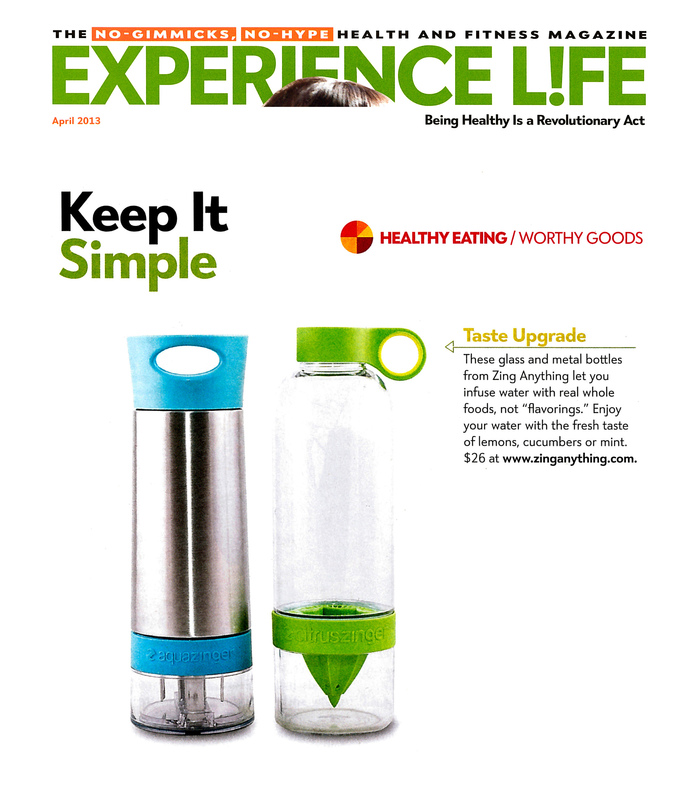 Zing Anything's water bottle allows the user to choose natural ingredients, such as fruit or mint, basil and rosemary, place the items into the bottom compartment of the bottle, and twist. The motion allows the flavors and aromas to be released into the Zinger. If drinking plain water feels boring, a new line of infusion water bottles might have you downright excited to drink eight cups of H2O daily. Who knew… we’re headed to Split to party on the beach! But first, let’s hit the airport bar with our new Zing Anything Citrus Zinger, our prize for winning this leg of the race! Nix the sweet stuff by swapping sugary drinks for flavored water or seltzer. "It's the best choice if you want something that's thirst quenching without added calories." Kreiger notes. 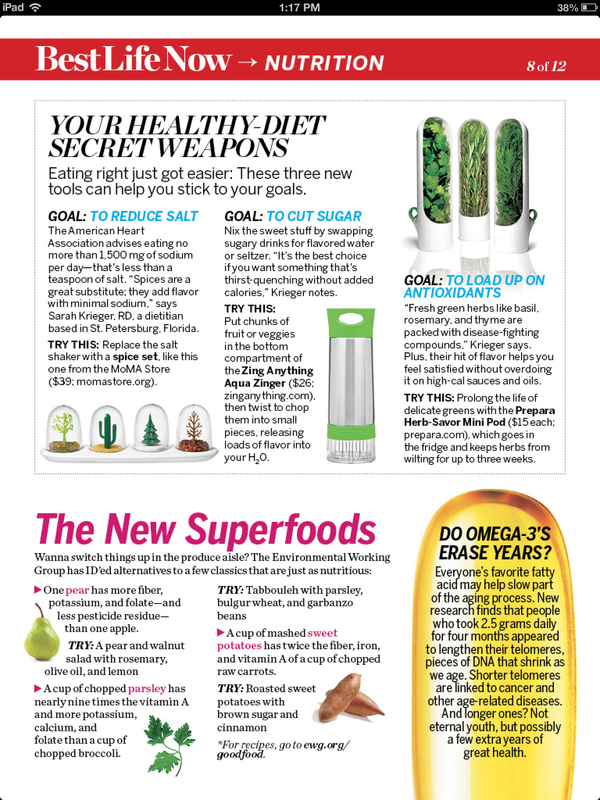 Now here is a new twist on having something refreshing to drink that is good for you. Help someone you know get away from soft drinks or fruit juices loaded with sugar with a Zing Anything Citrus Zinger water bottle. While we can see many an industry insider adding this to his or her kit, this D.I.Y charmer is sure to appeal to plenty of consumers this holiday season. 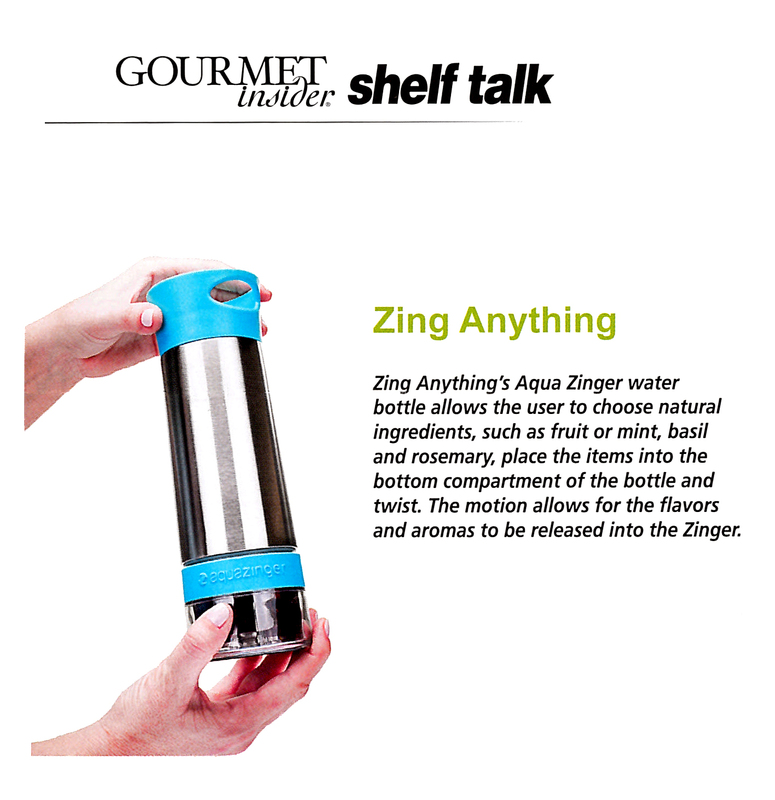 The Zing Anything water bottle line offers a refreshing DIY way to subtly infuse all-natural ingredients into water. 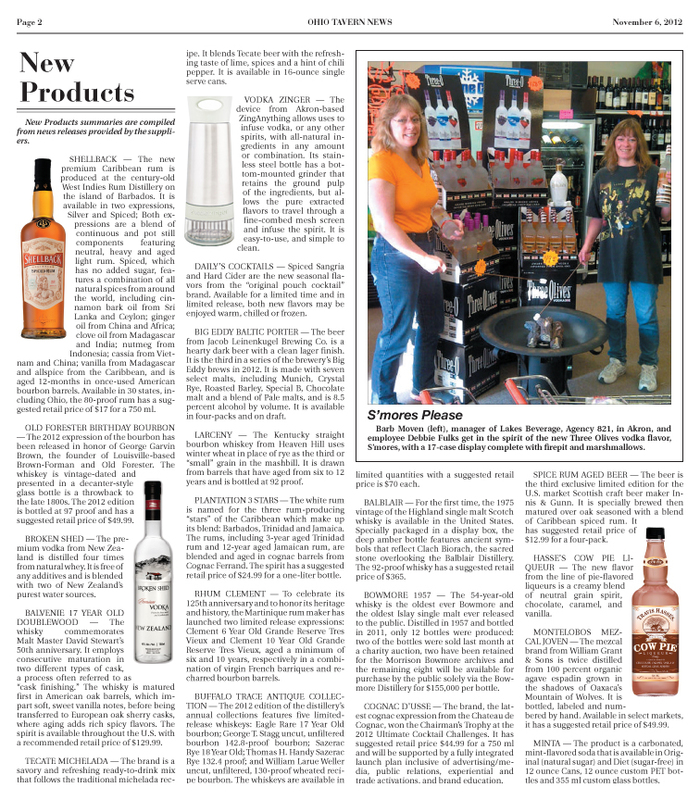 The Device from Akron-based Zing Anything allows users to infuse vodka, or any other spirits, with all-natural ingredients in any amount or combination. 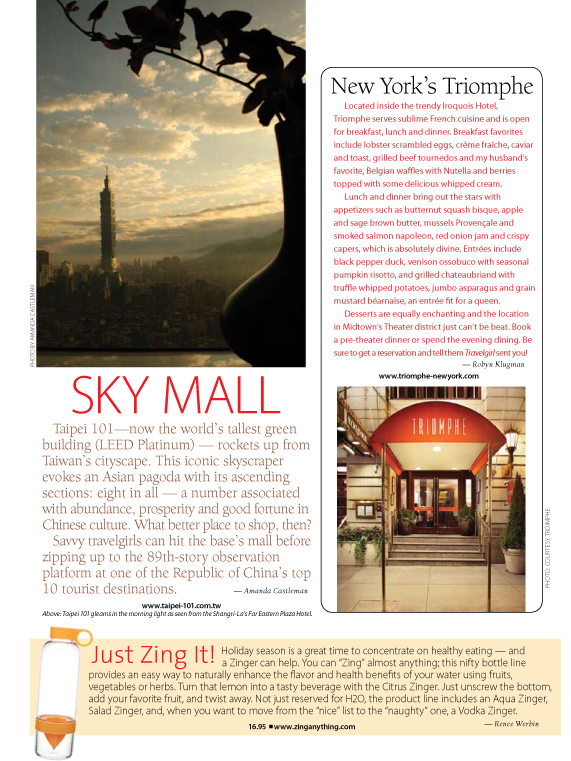 Women's travel magazine featuring tips for leisure time, travel, lifestyle advice, contests, finance, fitness, city profiles and vacation deals. Atlanta's Best Self Magazine provides readers with news on health & wellness, fitness & weight loss, beauty & skincare methods, & nutrition information. Trying to avoid sugary juice but find plain water boring? This convenient beverage bottle comes with a chamber that grinds fresh fruit. 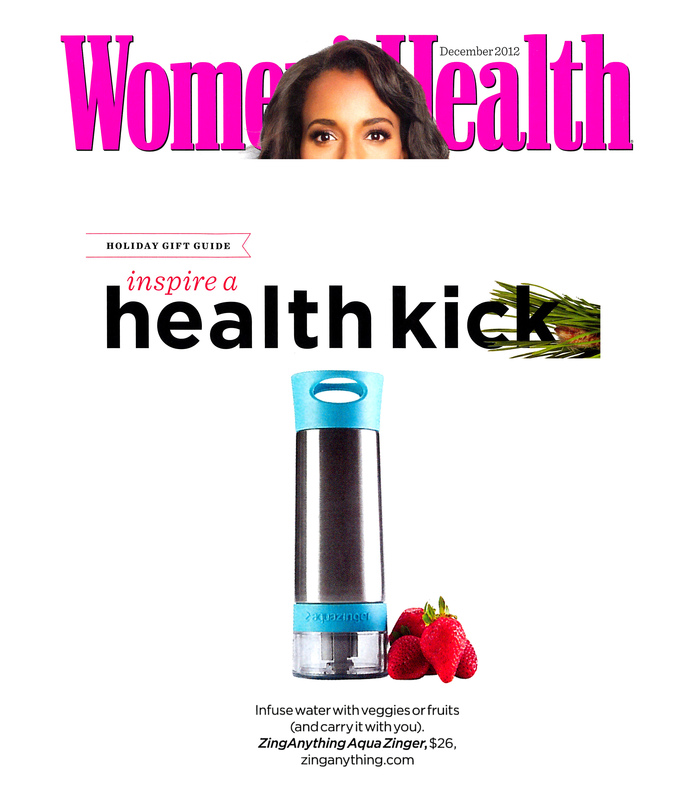 Just shake, then sip for water infused with vitamin-rich fruit flavor. 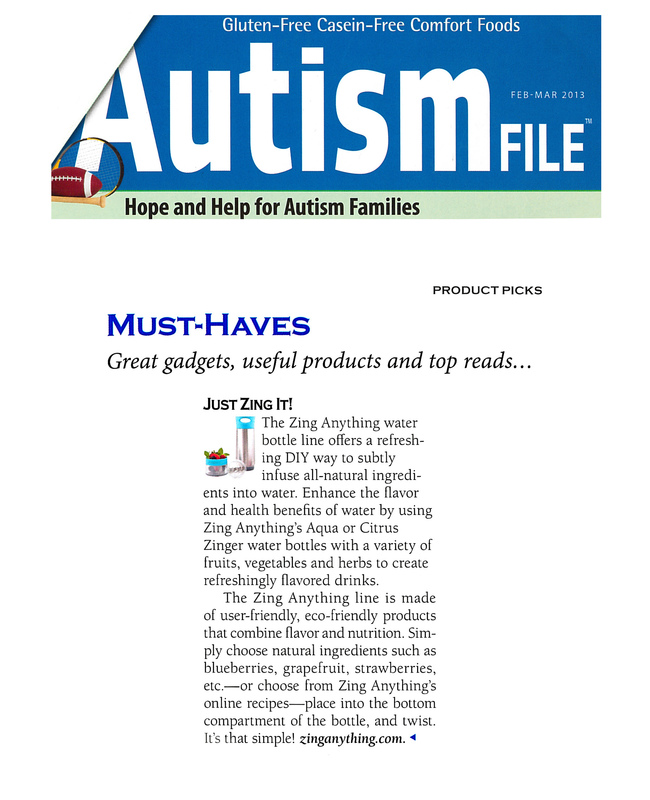 Japan's most popular business publication highlights Zing Anything as a trending product. 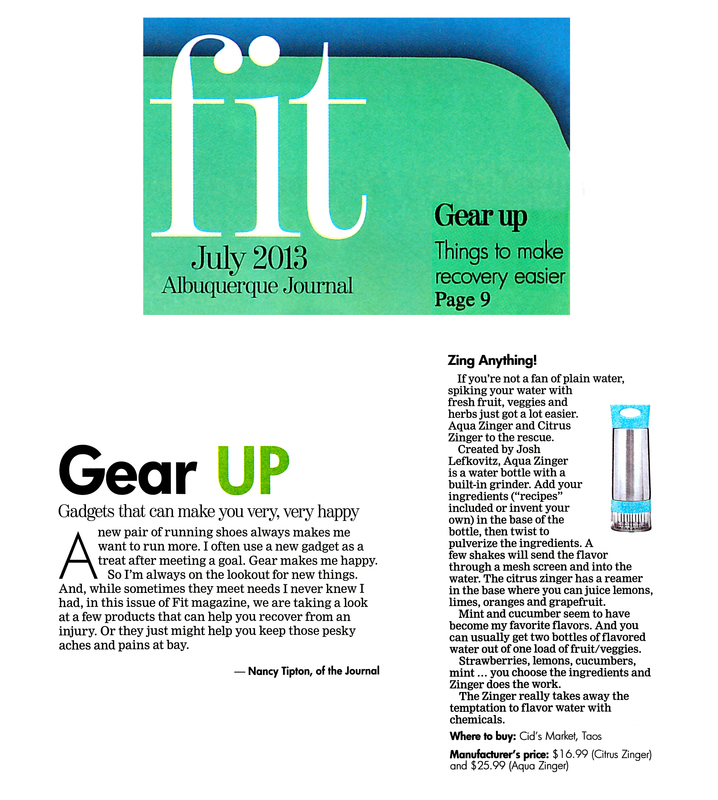 Carry around a bottle of spa-worthy slurping with the Aquazinger. At the bottom of the stainless steel vessel is a grinder and a strainer that lets you plop in fresh ingredients (we used cucumbers). Twist the container to get the juices flowing, shake and let steep for 20 minutes, and your H20 will have a noticeable kick. Drinking the recommended eight glasses of flavorless water per day can be difficult to do, but not with the new Zing Anything citruszinger water bottle. The citruszinger is equipped with a built-in flavor twister. Place a lemon, lime or small orange half on the citrus press and simply twist in the delicious flavors. 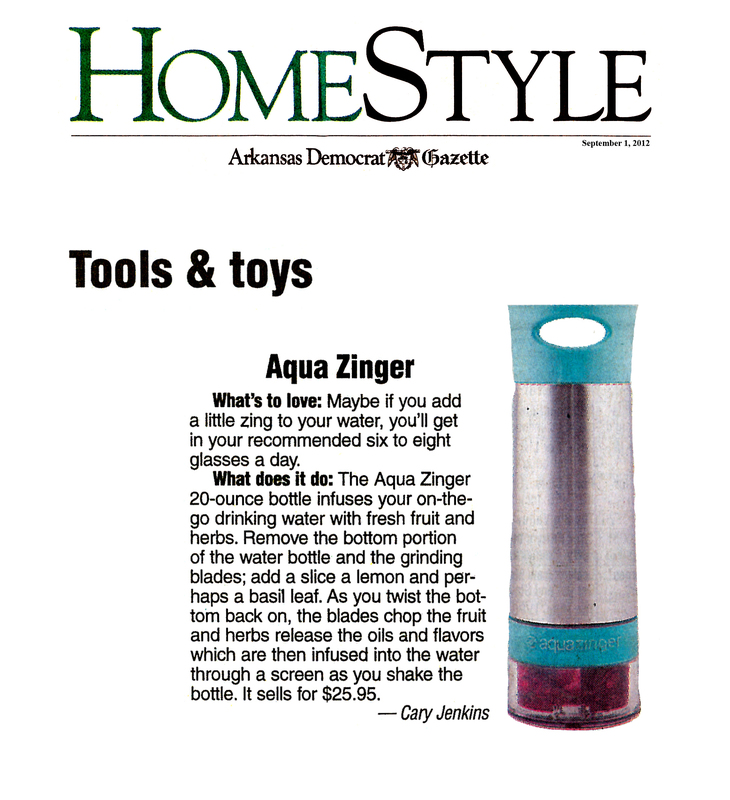 The Aqua Zinger 20-ounce bottle infuses your on-the-go drinking water with fresh fruit and herbs. Remove the bottom portion of the water bottle and the grinding blades; add a slice of lemon and perhaps a basil leaf.